The 20 task cards in this collection give you a sneak peek of several of my second and third grade Write To Explain Task Cards. 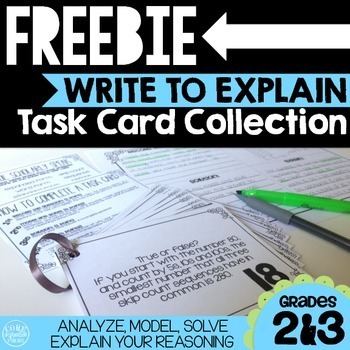 These task cards require students to map out their thinking by modeling a solution to each problem and then explain their reasoning in writing. Each task is designed to help you implement the Common Core Standards for Mathematical Practice in your classroom on a daily basis. As students become masters of the routines outlined in this task card collection, their problem solving accuracy increases and their ability to incorporate academic vocabulary and detailed reasoning into their explanations improves. Each mathematical concept you teach will be more deeply solidified as a result. Interested in building a complete task card collection? Click here to see all of my Write To Explain Task Cards. The reasoning and analysis process begins as students are required to attend to precision when they record the question word-for-word on binder paper or one of the recording sheets provided. Students routinely double-check their solution accurately answers the question. Students justify their conclusions and communicate them clearly in written form, further reinforcing their reasoning skills.